Very friendly downtown neighbourhood: steps to subway, walk everywhere! Private, Self-contained 1 Bedroom + Pullout Terrifically Close to Everything. Let us wow you with an authentic Toronto stay that is comfortable, relaxing and safe. Our spacious, renovated, private basement apartment can sleep 3, has heaps of amenities and is a heartbeat away from restaurants, shops, parks and the subway/metro. As a veteran of the global luxury hospitality industry, insatiable traveller and past VRBO guest, I come by my hosting inclinations honestly. I understand what makes a stay successful, and will do everything I can to ensure you have a great experience. Located steps away from Koreatown in vibrant and friendly Seaton Village, our clean, freshly-renovated art-filled basement apartment is a lovely, private, completely self-contained 900 sf/ 83 sm unit with one bedroom, pull-out sectional, wifi, full bathroom, washer + dryer, equipped kitchen, and closets! The apartment is in the basement and directly accessible from outside. It has a screen door and motion-activated overhead light outside the door. Please note the ceiling height is 75" / 191 cm in the apartment (87" / 221 cm in the bedroom); standing height in the shower is 74" / 1.88 m, but the shower head is detachable. There is an HVAC bulkhead in the bathroom over the washer/dryer. We usually recommend alternate accommodations for NBA players, much to their disappointment. We welcome singles, couples and families. A pack 'n play is available on request. If mobility is a concern, please be aware that there are 5 outdoor steps (with handrail) to access the apartment, and a few gentle steps leading up from the sidewalk to the house. A proud born-and-bred Torontonian, I live with my husband and 3 year-old daughter in a 100 year-old house in the friendly, vibrant and convenient downtown Toronto neighbourhood of Seaton Village / West Annex. I'm really fortunate to have travelled to 46 countries, 7 of which I have lived or studied in. For as much as I enjoy eating, drinking, shopping, site seeing and culturing my way around the world, I've realized that it's ultimately the people you meet that make all the difference. I look forward to welcoming you and hope that in some small way I can help make a difference to your Toronto experience. P.S. Can you guess where my profile picture was taken? Having grown up in midtown Toronto (and my husband in the suburbs), we weren't that aware of Seaton Village, the western extension of The Annex. One day on our bikes we took a different route, cutting through a lovely neighbourhood where people were out tending their gardens, talking to friends, kids were playing. All this and close to all the action of downtown! A year later a house came on the market and we grabbed it (no easy feat in Toronto's red-hot real estate market.) We've come to love the house and Seaton Village even more than we expected, and we're really happy raising our daughter in such a great environment. We live in a thriving community, where people sit on their porches, kibbitz with neighbours, and where everything we need is a short walk away. And if we need to leave the vicinity, the subway/metro is a two-minute walk. We feel so spoiled! Full bathroom with bathtub/shower (detachable shower head), washing machine, dryer. Fold-out table that can see up to 4 and can be easily re-arranged as needed. Used as desk as well. Stereo with CD player, radio, Energy speakers. Has iphone dock, but the older connector. Please note you must walk down 5 steps to reach the apartment entrance, as well as 5 gentle steps upwards from the sidewalk. We had a really cozy winter weekend in Toronto here. The whole flat is so lovely and all the conveniences you would like are there. We had tea and coffee and even some milk left in for us. The bed was so comfortable and the sheets were like silk. Also, the location is prime. The house is close to the subway stop and the neighborhood is amazing. There's a great coffee shop around the corner and bulgogi every where you could want it. I can't wait to come back and bring my son next time. I highly recommend staying here in this really charming place! The scent used to launder the sheets and the use of Bounce was a real challenge causing me breathing and sleep difficulties. Took me two nights to figure what the problem was. I would strongly recommend that all Air B n B not use any scented detergents. Otherwise everything else was great. Jerry, thank you for your review. I'm very sorry to hear the laundry detergent was a challenge. Normally guests prefer the scent which is why I use it. Had you mentioned your sensitivity in advance or while you were here, I could have easily and quickly provided you with clean bedding laundered in unscented detergent. I would suggest perhaps in future you request this in advance when using these types of accommodations to ensure your comfort. I'm glad you enjoyed the rest of your stay, and I hope the conference was a success. Alexa has helped us in many ways. The basement is nice and well located. The bathroom ceiling is low but it's got to go through. Very happy with our choice of this apartment! Can't say enough great things about this apartment!! First let me say the apartment itself was perfect for our needs. We were 2 friends in town for the weekend. The apartment was clean, well appointed with items we used(coffee, sugar, shampoo, even floss if you forgot yours). I feel Alexa truly thought of everything! The bed was comfortable; as was the pull out couch. The neighborhood was ideal for us! Subway is right around the corner. The neighborhood is lively, walkable, and the people there are friendly and approachable. Many choices for food and drinks. Would definitely stay there again! Tricia, thrilled to hear you had such a good time. I’m glad you enjoyed the neighbourhood and the apartment (inevitably I always run out of floss when travelling, so I like to provide as a courtesy.) Please come and visit again! 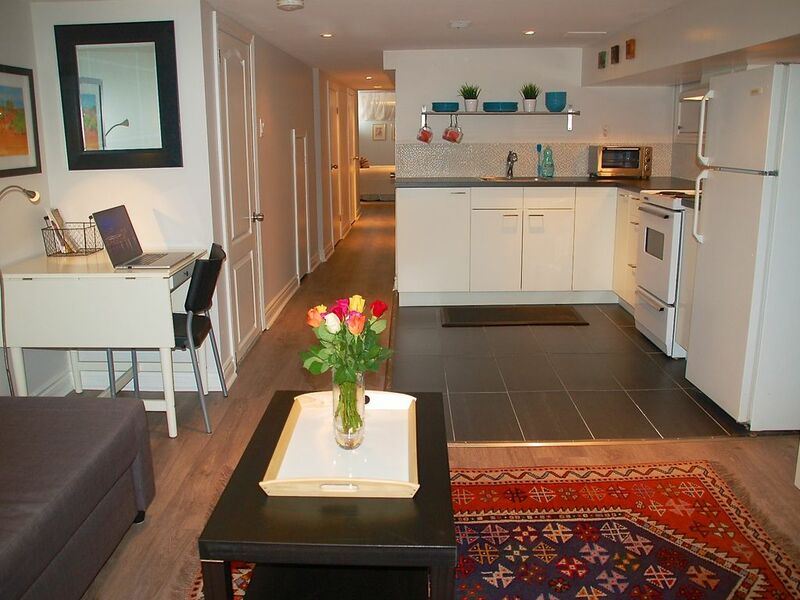 This apartment made for a perfect retreat while I was in Toronto for a work project. The apartment is cozy and well-equipped. The neighborhood is lively and convenient to restaurants, grocery stores and subway station. Alexa was a great host - checking in to make sure I was O.K. during the ice storm that descended unexpectedly on the city during my stay. She also was prompt in answering any questions I had. Very comfortable unit in a quiet neighbourhood. Tons of restaurants a few minutes away. Very friendly owners. Thank you, Nathalie. It was a pleasure hosting you! I hope your tournament went well. Please come visit us again! Within 5 minutes’ walk you can reach restaurants, bars, live music, coffee joints, supermarkets, shops, banks, parks, transit. Little Italy, Kensington Market, University of Toronto, the Royal Ontario Museum, Bata Shoe Museum, Art Gallery of Ontario, Wychwood Barns are all nearby. Why do I love my neighbourhood? 1. Because I can eat Korean, Mexican, Mexican Korean, Japanese, Indian, Ethiopian, Italian, Middle Eastern, Latin American, Cajun, Thai, Spanish, BBQ, or Burgers and burn off the calories on the walk home. 2. Because I can run out and grab groceries from Toronto’s largest independent grocer (Fiesta Farms), or an organic fruit and vegetable corner store, or an Asian supermarket, or a newly-renovated snazzy Loblaws. 3. Because Toronto’s best coffee shop (Sam James Coffee Pocket) is around the corner. 4. Because we're one block away from Christie Pits, former sand pits turned parkland used for picnics, baseball (home of the other Toronto Maple Leafs), playground with splash pad, outdoor pool, skating, tobogganing, and outdoor summer festivals. 5. Because I can get lost in the maze that is Honest Ed’s, catch a first-run documentary at the Bloor Hot Docs Theatre (part of the Bloor Street Culture Corridor), or sing the night away in a private karaoke room. 6. Because it's really close to other great neighbourhoods, like Little Italy, the Annex, Wychwood, University of Toronto, Dufferin Grove, and great public transit is right here. 7. And because it's a super-friendly place where neighbours regularly catch up with each other on the sidewalks while the kids play outside. There's good reason why Seaton Village is one of downtown Toronto's most coveted areas to live. Saturday June 5 - Sunday June 6 - Korean Dano festival at Christie Pits park. Sunday, June 14: Annex Family Festival. Bloor street from Bathurst to Spadina is closed 11 am - 6 pm for a big street festival. Saturday, June 20: Open Tuning - an amazing, serendipitous Seaton Village music festival where neighbours turn their porches, garages and alleys into performance stages. There are truly talented people in this neighbourhood! Saturday, July 11: Clinton St. block party! Our block is closed to traffic with lots of festivities. My favourite part is the potluck, where the centre of the street is lined with tables and everyone comes out to contribute food and partake in the feast. Saturday, July 11: Mirvish Village Summer Sidewalk sale. Music, food, shopping. Saturday, September 19: Mirvish Village Summer Sidewalk sale. Music, food, shopping. We thank you in advance for treating our home like your own! No smoking or pets are permitted. Please keep noise to a minimum after 11 pm. Thank you!